The Super-Takumar 28mm f3.5 is a wonderful vintage lens for your travel and street photography. Come and see why I and many others rate it so highly. This post contains affiliate links. At no additional cost to you, I may earn a commission if you click through and make a purchase. The Super-Takumar 28mm f3.5 is not a vintage lens that should be in your bag. And that’s because it should be on your camera. Yeah, this is going to be one of those kinds of reviews. The kind where I tell you how good this lens is and how much I enjoy using it. That wasn’t always my opinion of it, however. How old is my Super-Takumar 28mm f3.5? Is my Super-Takumar 28mm f3.5 radioactive? Super-Takumar 28mm f3.5 lenses were produced by the Asahi Optical Co. If the name Asahi is more synonymous with beer nowadays, that’s probably because the Asahi Optical Co. would eventually become known as Pentax. The company produced the Super-Takumar 28mm f3.5 lenses between 1962 and 1975 for its range of film cameras. It was a range that included the popular Asahi Pentax Spotmatic. The best place to find your own Super-Takumar 28mm f3.5 is eBay. You can instantly check out the latest listings and prices by clicking here. There were four iterations of the Super-Takumar 28mm f3.5, and the look of them changed slightly over the years. The first versions of the lens were produced between 1962 and 1965. A slightly updated version was made between 1965 and 1966, with a genuine Mk2 then being introduced and produced until 1971. This final version of the lens, which ran from 1971 to 1975, was given the Super-Multi-Coated label, due to the multi-coated treatment it was given to reduce lens flare. The easiest way to know which version you have is to check the product code on the back of the auto/manual diaphragm switch and see where it is in the table below. I know that mine, saying Super-Multi-Coated on the front and having the product code 43872, is the last version. That’s quite a question to hit you with, isn’t it? It stems from the Super-Takumar 55mm f1.8 and 50mm f1.4 being infamously radioactive, along with several other lenses made by various different manufacturers between the 1940s and 1970s. From the information I can find online, like here for example, the 28mm Takumar is thankfully free of any radioactivity issues. For more information on this, you can check out the section on it in my Super-Takumar 55mm review. The first picture above is the 28mm alongside that radioactive Super-Takumar 55mm f1.8. You can see their diameters are pretty much the same, and I can tell you that so are the physical lengths at around 40cm from front to mount. However, they’ll likely be longer than that on your camera as you’ll likely need to use an adapter. The size of these adapters varies depending on the camera you have. I use mine on a Sony mirrorless. If you’re looking for a good, small camera body to use your vintage lenses on, I do recommend the Alpha range. You can find them on Amazon here. To use the Super-Takumar 28mm f3.5 on a Sony mirrorless camera, you’ll need to use an m42-NEX adapter – which are readily available on Amazon too. If you use a different camera with a different mount, you’ll need a different adapter. It will still begin with m42 as that’s the lens mount, with the second part of the name matching your camera mount. You can likely find yours in the table below. If not, head to Amazon and do some digging until you do. The first couple of times I shot with the Super-Takumar 28mm f3.5, I wasn’t sure if I was going to like it. The lenses I was used to shooting with were a little different to this one in a couple of ways. The first being the focal length, of course, and the second being how wide I could open up the aperture. I’d often shot by looking for smaller details in things and having lenses open for a shallower depth of field. With the 28mm f3.5, this was not really possible. Even with a x1.5 APS-C crop sensor, wider shots and more depth of field were the order of the day. A completely new way to think about composition. It’s not the lens’s fault I wasn’t sure how to shoot with it. I knew this. I just had to shoot differently, and I wasn’t sure how. But with research and practice, I began to get used to the new style. 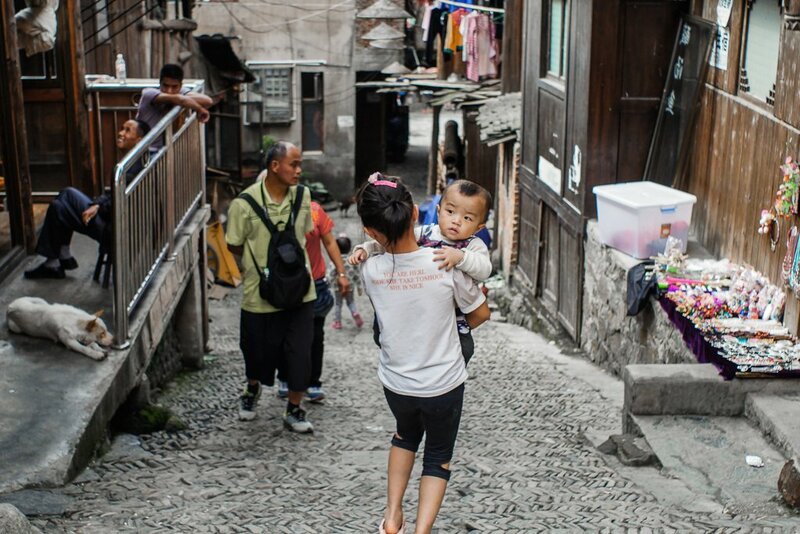 The first time I fell in love with the lens was on a trip to the Xijiang Minority Village in China, and a big reason for that was having just read an eBook that helped me learn more about travel photography. In particular, reading about landscape shots and environmental portraits. These were two things that I hadn’t really shot with my other vintage lenses, and learning about them was a big help in getting results out of the Super-Takumar 28mm f3.5 that made me happy. Again, the best place to find your own Super-Takumar 28mm f3.5 is eBay. I’ll say this right away: both the image quality and the build quality of the Super-Takumar 28mm f3.5 are excellent. It’s a satisfyingly weighty, solidly constructed little block of metal and glass. The focus ring is smooth and the aperture ring gives nice polite clicks as it moves through the half-stops. It must be remembered the lens is older than me, and maybe you too. And although there are some cosmetic imperfections, it works as well as I imagine it always did. These things were built to last. As for the image quality – well, like any lens old or new, you’re sure to find some drop off in sharpness when you shoot wide open. However, shooting at 28mm has taught me the value of shooting at f8, and so I’ve found the lens gives me very good results. I don’t do test shots of inanimate objects at various apertures and present crops of them for people to pore over, though. Instead, the gallery here is full of real world shots I’ve gotten from the 28mm Super-Takumar. You may or may not think they’re any good but it would be down to me, and not the lens, if you don’t. Despite the above trip to the Chinese minority village and the shots I came home with, I do shoot a lot more street photography than travel photography now. Again, I wasn’t sure what would be possible with the Super-Takumar 28mm f3.5 in the beginning, having shot with longer lenses for so long. I wasn’t sure about getting closer to people to shoot them, and I wasn’t sure about shooting without the ability to have such a shallow depth of field. In both cases, all it took again was some practice for me to get over these perceived issues. Doing so has also helped me grow more as a photographer. Being able to include more background in my street photography means I can add more layers to the composition. I can take more than just shots of people. It’s easier to include shapes and geometry of the environment to tell more of a story. I’ve also realised how unnecessary it is to need a shallow depth of field all the time. In fact, I think now it’s a little amateurish to use it so much. I believe there’s a stage in a photographer’s development where we think images are good because of what the camera can do, rather than what we can do with it. Shooting at f8 rather than at f2.8 all the time pushes us towards making good images through our own skill and not through the camera’s capabilities. I’m still a work in progress, and I hope I always will be, but this lens has certainly helped me go in that direction. After shooting a lot of travel and street photography with the aforementioned Super-Takumar 55mm f1.8 and also my F.Zuiko 38mm f1.8, I’d reached the point where I wanted to try a different focal length. Going longer than 55mm didn’t appeal, so I had to look wider than 38mm. 35mm seemed a little too close to be worthwhile, so I spent time researching good value, wider angle vintage lenses. Initially, I must point out, without much luck. One of the reasons we have so many vintage lens options to choose from around the 35mm to 50mm range is they were the most commonly used prime lenses back in the day. And still are today, to be fair. This means more were made, which in turn means even very good examples of them are available for not much money today. Finding a wider angle vintage lens, of which fewer were produced, means either paying a lot or buying something of poor standard. According to the research I did, 28mm was about as wide as I could find without compromising too much on price or quality. When I looked on eBay, there were plenty of other options at this focal length. However, the fact that I already had the m42-NEX adapter – the same adapter as I use to marry the Super-Takumar 55mm to my Sony mirrorless – helped me settle on the 28mm Takumar too. I know not everyone will be as into vintage lenses as I am, but there’s a fair chance you have at least some interest if you’ve read this far. Perhaps you’re even interested in trying one out for yourself. Whether you’ve shot with a classic lens before or not, the Super-Takumar 28mm f3.5 is a good one to pick up. You can easily check the selection on eBay and get yourself a nice one. Even though I always shoot with prime vintage lenses, shooting with the wider 28mm focal length has helped me to develop further as a photographer. If you usually shoot your travel or street photography with a zoom lens, I highly recommend trying out a prime lens yourself. There’s no reason why this shouldn’t be a Super-Takumar 28mm f3.5. They’re inexpensive, and both the build quality and image quality are great. You will need an adapter, but they’re not expensive either. You can easily find and order one from Amazon. If you need a small, interchangeable lens camera body too, you can check out the Sony Alpha range on Amazon too. You’ll then have both for all the other Super-Takumars you buy in the future. They’re not called Super for nothing, you know. Remember, the best place to find your own Super-Takumar 28mm f3.5 is eBay. Found this Super-Takumar 28mm f3.5 lens review useful? Have one yourself? Let me know in the comments below or hit me up on Twitter! And if you think others will find this review useful too, why not share or pin?